More of a mess than the pleasant surprise one might have hoped. 104 min. 20th Century Fox Distribution. Director: Scott Derrickson. Cast: Keanu Reeves, Jennifer Connelly, Kathy Bates, Jon Hamm, Jaden Christopher Smith. When a classic gets the remake treatment, cries of "Sacrilege!" begin to bounce around the places where film buffs congregate, and usually for good reason. And yet there was cause to hope that a provocative update of The Day the Earth Stood Still could capitalize on our contemporary mood of environmental doom to reach a new audience. Sadly the results of the remake skew toward being more of a mess than the pleasant surprise one might have hoped. As one incognito alien (James Hong) says of humanity, "The tragedy is they know what's going to become of them. They sense it. But they can't seem to do anything about it." Klaatu agrees that the human race has reached its "tipping point." Learning the horrible truth about the aliens' plans, Benson attempts to convince Klaatu that the human race deserves a last chance to turn things around. Benson and the Nobel Prize-winning Professor Barnhardt (John Cleese, in a serious turn) are mutually hopeful that, "At the precipice, we change," though it's unclear that the aliens can be convinced of the same. Even Klaatu isn't sure that, should his mind change, he'd be capable of calling off a corrective genocide of humanity (the point being to save the planet from us). Director Scott Derrickson (The Exorcism of Emily Rose) lets down the fundamental thoughtfulness of this premise by fearfully running away from dialogue and towards loud demonstrations of style and action that are alternatingly portentous and flashy (and commercial, an impression hammered home by one of the most garish product placements of all time). As a narrative, this leaves the picture sorely disjointed, even more so for someone who's never seen the original film. It doesn't help that the special effects are so uneven: much involving the alien presence is dazzling, but Gort never looks like anything other than bad CGI animation. At least the film makes one clever left turn by having the kid not be immediately charmed by the alien: this time, it's the parent who's ahead of the curve. 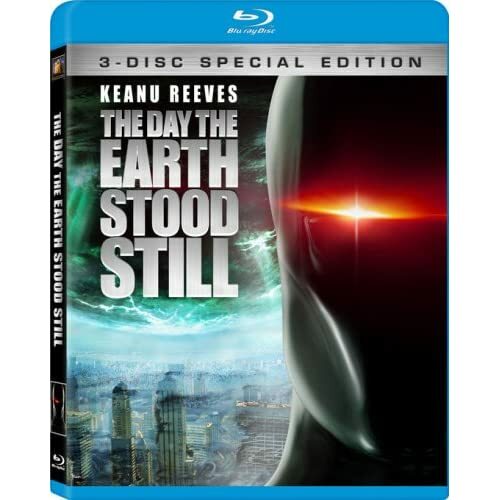 Fox's deluxe three-disc Blu-ray edition of The Day the Earth Stood Still offers high-definition transfers of both the 2009 remake and the 1951 original (though the latter comes without the stellar bonus features found on its separate Blu-ray release). The A/V quality is typically outstanding, as one would expect of a freshly minted film. The image is rock solid, and accompanied by a full-bodied DTS-HD Master Audio 5.1 sound mix. The color-coded Blu-ray remote buttons provide access to a number of "in-movie" bonus features. The green button turns on the audio commentary by writer David Scarpa. 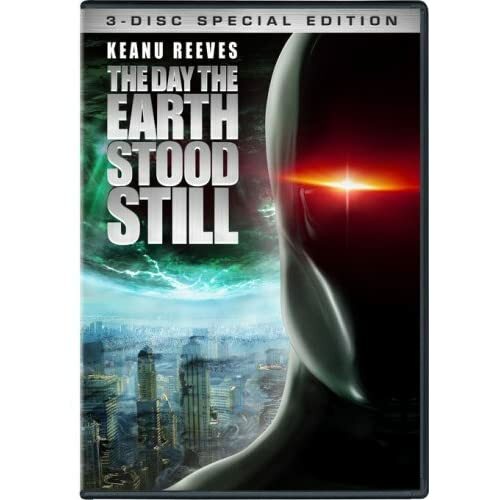 The blue button launches Klaatu's Unseen Artifacts: The Day the Earth Stood Still Picture in Picture Track, a BonusView making-of mode displaying pre-viz, special effects footage and photos. The yellow button brings up storyboards. Four featurettes look behind the scenes. "Re-Imagining The Day" (30:06, HD) is a fairly thorough behind-the-scenes look at the film's making, with interviewees ranging from director Scott Derrickson to film historian Paul Sammon. "Unleashing Gort" (13:52, HD) features VFX supervisor Jeffrey A. Okun, who explains the thinking behind the robot's design. "Watching the Skies: In Search of Extraterrestrial Life" (23:08, HD) is similar to the featurette "A Brief History of Flying Saucers," found on the recent special edition of the 1951 film. Lastly, "The Day the Earth Was 'Green'" (14:04, HD) examines the eco-friendly, carbon-neutral nature of the 2009 production. There's also a Build Your Own Gort feature, allowing viewers to construct their own design from the spare parts of the final and unused character designs; three "Deleted Scenes" (1:56, HD), the "Theatrical Trailer" (1:48, HD) and Still Galleries. It all amounts to a fairly definitive special edition presentation for the 2009 film. All site content © 2000-2019 Peter Canavese. Page generated at 04/18/2019 12:45:13AM.